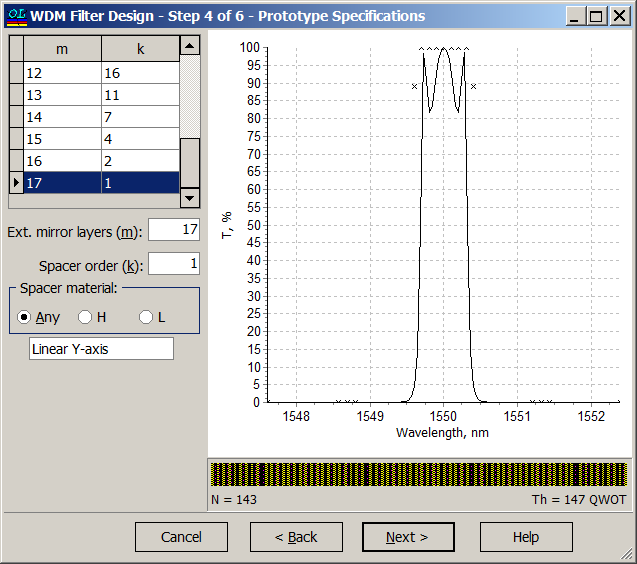 OptiLayer provides a unique fully automated approach aimed for automatic design of WDM, DWDM, HDWDM and all other types of filters used in modern telecommunication applications. The approach is based on the combination of ideas from classical design approaches with an integer optimization. This approach turns out to be extremely efﬁcient from a computational point of view and makes it possible to construct a set of signiﬁcantly different ﬁlter designs with nearly equivalent spectral properties. 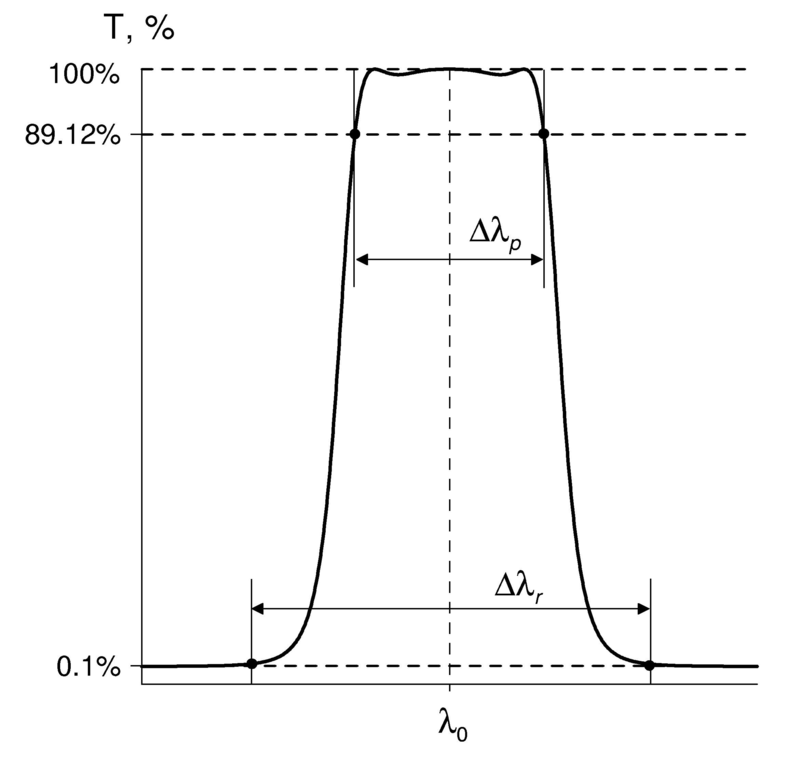 It is an important feature of this option that design layers (excluding one or two top anti-reflection layers) are multiple of a quarter-wave optical thickness at the central wavelength of the filter. Due to this fact the error self-compensation mechanism can be explored for the manufacture of designed filters. WDM specifications require high steepness of transmittance slopes in the transition zones between passband and stopband. Standard Fabry-Perot filters cannot meet these demands. For more detail see WDM Filters article. 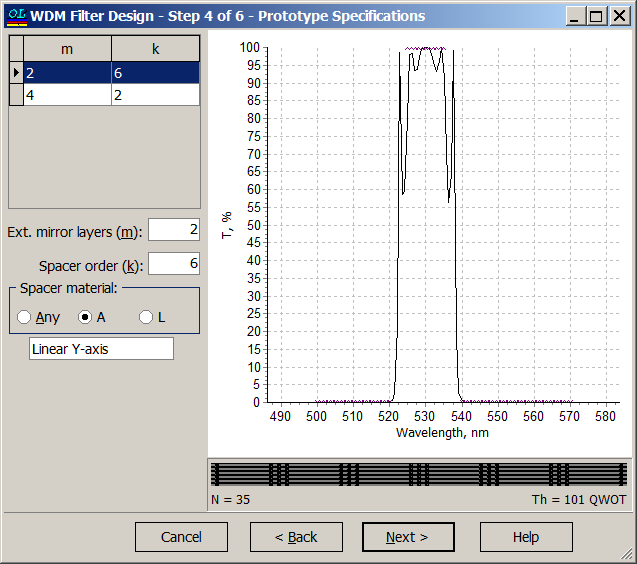 Example: Black curve – transmittance of the 110-layer WDM filter with four spacer layers, red curve – transmittance of the 35-layer Fabry-Perot filter. the orders of spacer layers \(s_1, s_2,...\). 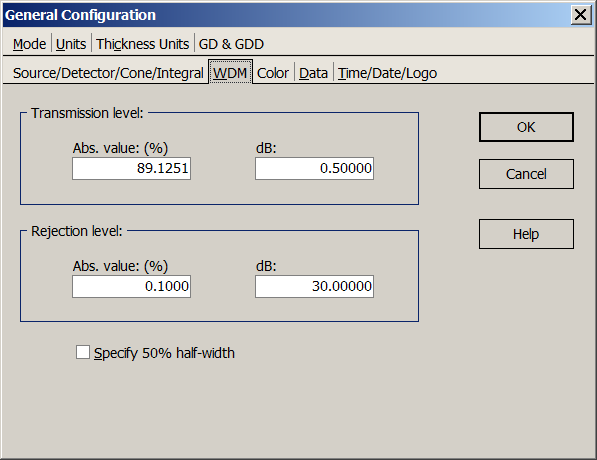 Specification of target WDM parameters are organized in a six-step dialog. 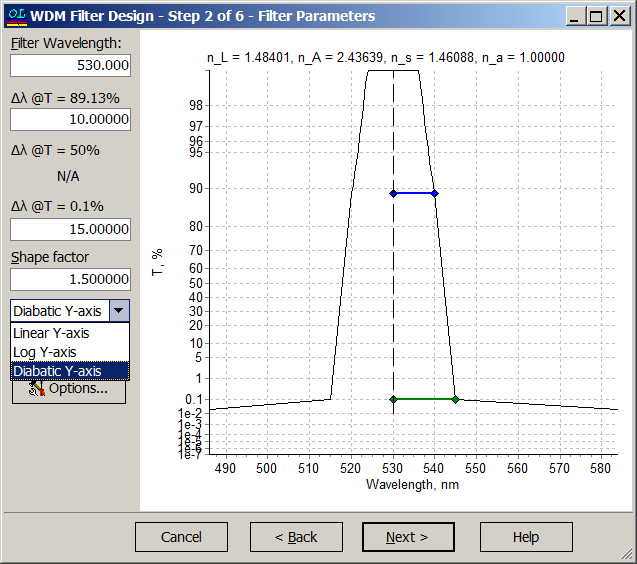 WDM filters consists of several mirrors and spacer layers which allow one to control pass band width and transmittance slopes simultaneously. 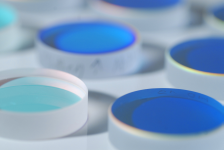 After setting target specifications and layer materials OptiLayer gives you the recommendation on the number of cavities (filter spacer layers). In the example: 4 and more. At the next step OptiLayer lists all possible prototypes. Each prototype can give a design solution. You can also specify spacer material. In the example: Any material is specified for Spacer material. The filter prototype with m=17, k=1 has 143 layers and its optical thickness is 147 QWOT. In order to optimize the prototype with respect to the entered specifications a comprehensive mathematical procedure is used. It is possible to consider some mirror layers/cavities consisting of an additional material. 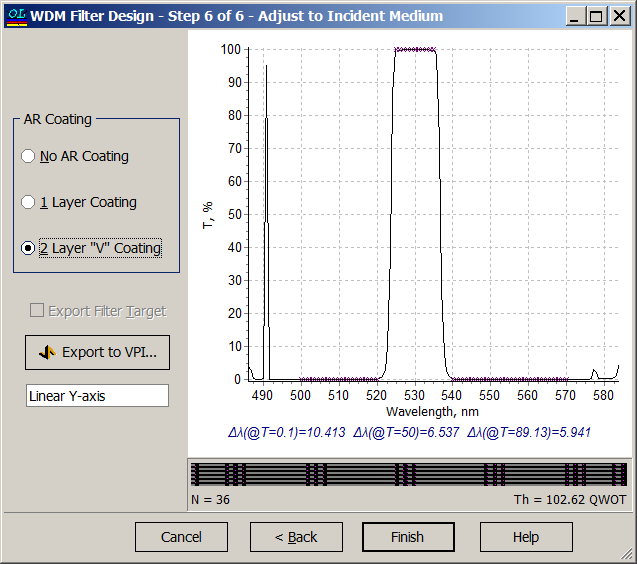 At the last step of design process you can adjust the obtained filter solution to the actual incident medium. For this purpose one- or two-layer AR coating can be placed at the top of the design. 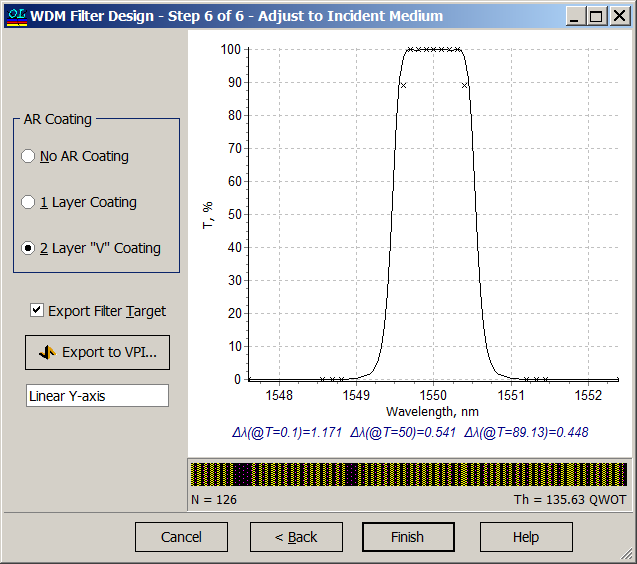 The WDM filter design approach can be also successfully applied for narrow band pass filters in visible and near-IR. 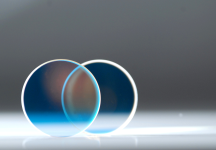 OptiLayer provides additional opportunities for achieving excellent filter spectral properties by using mirrors with 3-quarter wave layers. This gives more freedom in controlling steepness of phase shift upon reflection in filter cavities. 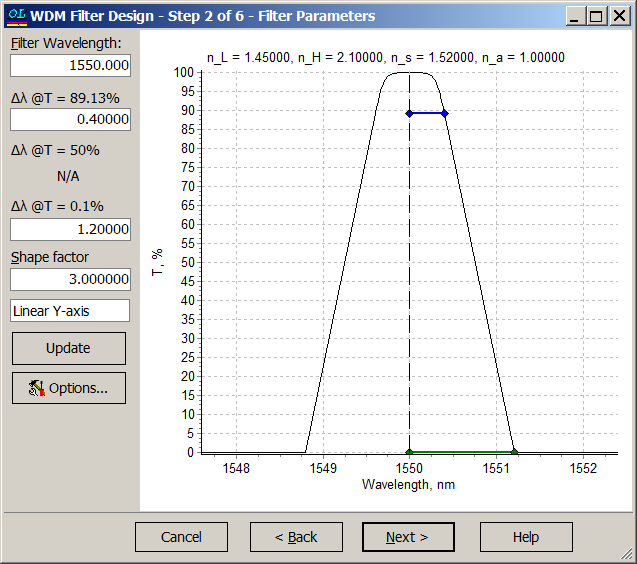 Example: narrow bandpass filter for the spectral range from 500 nm to 570 nm. High transmission range is from 525 nm to 535 nm, low transmission range is from 500 nm to 520 nm and from 540 nm to 570 nm. In this case \(\lambda_0\)=530 nm, \(\Delta\lambda_p=10\) nm, \(\Delta\lambda_r=15\). 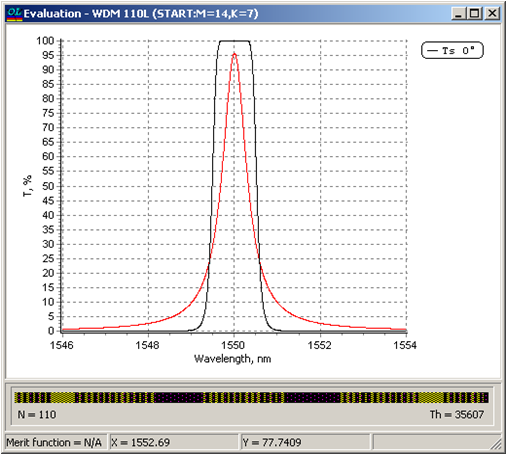 OptiLayer allows indicating transmittance values (Y-axis) in linear scale, logarithmic scale and diabatic scale. The number of cavities (spacer layers) recommended by OptiLayer is more than 6. 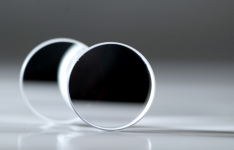 High refractive index material is specified as spacer layer material. 35-layer prototype can be considered. 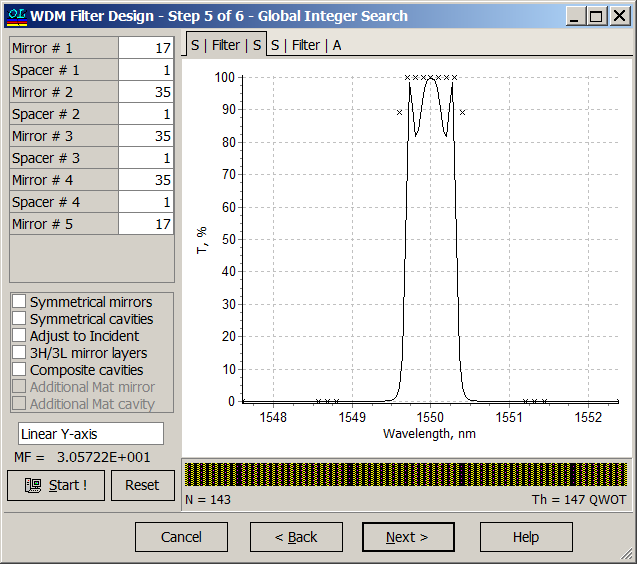 Final result: 36 layer narrow bandpass filter. Two last layers is anti-reflection coating.